Here's a collected listing of the active robot streams right now. It is meant for quick reference, detailed info and programming should be sought from the respective forum topics. LIVE transmissions during late evenings! "40 hours of Italian soundtracks from the 60-80s. Tons of Goblin." Accepting requests via #CBS on Ircnet. Tradition is kindling of the fire, not worship of the ashes. Kvantti, maybe you can add Robotdj.net radio to the list ? good to see there is a robotdj.net stream! but on my mac it did not get it working yet..
how do you advise to listen to it? Bas roR your stream is refueling my circuits! trying to keep the energy flowing. biotek's robotdj is truely cosmic. it now accepts requests via our IRC chatroom! kvantti, can you add the link for the regular shoutcast streams as well to Radio 1972? is there any way to find out what is being played on robotdj.net stream? never mind found it! on the robotdj.net splash page..
Stan, is you use iTunes the info scrolls, and also if you have modded the RobotPlayer to tune in. Can't say for any others. I only use those for that stream. hey kvantti, any chance of adding Magic Waves to that list? i haven't been able to connect to Bas roR's roRbot FM for the past few days. Any URL change? Just send a mail to one of the admins then......they can edit all posts. Bas roR for instance, then he can also answer to the connection fail question. hmmm will restart the whole transmitting computer.. my url is still the same. no radio because you can for example skipppp for the next song..
As one little tribute for x-bobo, We will broadcast old Basic Radio show (basic.ch internet radio) from 2002 on till .... we'll see..
22 DJ`s Playing ELECTRO - JAZZ - FUNK - HIP HOP - BREAKS - DISCO. You can listen to the DJ`s live! Some colleagues and I got a 2-hour stint on the otherwise questionable University of Texas at Dallas streaming Radio. Listen in on Friday nights from 12-2am Central Standard Time for various guest DJ's from the Dallas area as well as live PA sets. Last year's guests include the likes of Minto and Brian Hurley, and some of this year's forthcoming guests include Jonathan Graham and a live PA set from Convextion. 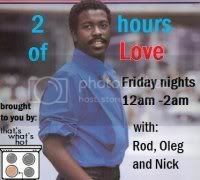 NOTE: THE VIEWS AND MUSIC EXPRESSED OR PLAYED AT ANY TIME OTHER THAN 12-2AM ON FRIDAY NIGHT/SAT MORNING C.S.T. ARE NOT REPRESENTATIVE OF 2 HOURS OF LOVE, ITS HOSTS, GUESTS OR LISTENERS.